10 Best Free DVD Burning Software for windows: – When you copy pictures, audio files or videos from your computer to a blank DVD or CD, the process of copying is known as burning. Burning is a simple way to transfer files to a CD directly from your PC or laptop. What we are actually doing is writing the blank CD, but since the CD writer actually burns the information on to the recordable CD, we say we are “burning” the DVD or CD. This free software for burning DVDs comes with a simple user interface and offers basic burning facilities, nothing too advanced. However, it is able to support a wide variety of disc data storage including CDs, DVDs, Blu-Ray media etc. The software also provides verification to check whether your DVD or CD has been burned successfully, offers backup for your files along with copying and creation of image files. The only con might be that it is not free for commercial use, only for personal use. Otherwise, it is a great simple and utilitarian software for burning DVDs and CDs. This completely free software is extremely easy to use, even for beginners. It supports ISO images as well to create new image files. It has a drag and drop files option enabled so you don’t have to perform many tasks manually while selecting the files you want to be burned to the DVD. 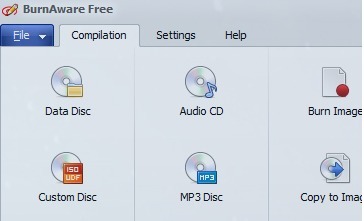 Free CD DVD Burner also supports a variety of audio file formats such as WMA, WAV, MP3 etc, and is compatible with Windows. With a neat and clean interface, this software enables you to burn several kinds of discs, choose to burn audio CDs with gaps in between tracks, or without gaps if you prefer. The software comes with a multi-language interface, making it more popular among users who wish to work with a language other than English, or who are not very familiar with English. The coolest part is that this software is perfectly compatible with all versions of Windows, from XP to Vista to the latest Windows 10. However, it can only work with ISO format when it comes to image files, so that could be a con to many users. This free software makes the process of burning shorter and faster by reducing the number of clicks one has to make in order to select and transfer files. It allows you to select your preferred layout, color and other options for print compilation and offers cool online upgrades completely free. 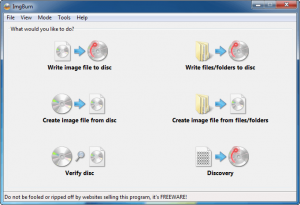 Burn4Free offers the user four ways to burn the DVD: drag and drop, right click from explorer, internal add window, fly window; so the user can choose whichever method they are comfortable with. This software also offers multi-language interface, which is another pro. Though several users have complained of the software bringing malware into their systems it may be because Burn4Free keeps trying to install the NavExcel toolbar, and one must remain cautious and not allow Burn4Free to install it. The software itself is easy to install, but one must exercise some amount of caution while using it. This software easily supports most video formats, making it easy to burn video files and movies with it. The user is allowed to set their own menu up, with preferred colors, fonts and many more options offered. This customization makes the software quite popular among those users who like to have a personalized experience with the software they use. One con may be that there is no option to preview your work before you burn it, but since the interface is simple enough to understand and follow, the user is most likely to anticipate the results correctly and not be bothered much by lack of preview. This software offers a trial period for free, if the user is pleased with its performance, they can go ahead and buy the full version software. Alternatively, if the user is not happy with it, they won’t lose any money and can make the right decision after the trial. Coming to the software itself, apart from quick and neat burning features, it also provides a range of advanced video and image editing tools. The user can snip off parts of the video clip they don’t want, can join one segment with another, and tweak audio and brightness, along with many other features. If one can pay a sum of money to buy this software, it won’t disappoint them. Moreover, the free trial ensures you won’t have to buy the software without getting to use it before. Ashampoo Burning Studio is an effective and neat software for burning your CDs and DVDs. The splash screen provided enables you to learn more about the features offered by Ashampoo, and how you should register for it. The interface is straightforward and doesn’t claim to offer advanced tools that actually will not work when you try to use them, like in much other software out there which promise many features but are able to offer none. The software can also create password protected records and backups of your files. However some users have complained of its inability to create ISO image files, so if you want to burn images, in particular, this might not be the one for you, but for burning videos and movies, Ashampoo is particularly good. ImgBurn is able to burn video files of almost all formats, even those that are incompatible with expensive software. It comes with a simple interface but offers advanced options as well- catering to beginners as well as those looking for tools enabling more than the simple process of audio and video burning. Several custom settings are offered to those looking for advanced options, but not displayed in such a way that it would confuse beginner users. These options are highly detailed and easy to work with if you know what you’re specifically looking for. The help guides offered are excellent and easy to understand, and the community forum is always active and prompt to reply, making this software even better. The best part is the software is completely free! This software is superb for easily burning DVDs and editing audio, image and video files before burning. Wondershare allows you to experiment on a large scale with your files- crop images and resize them, edit the brightness and saturation level of video clips, add watermarks and labels to videos in any font and style you prefer. You can use the built-in editor to Touch Up videos, or even create your own. You can choose from a wide range of templates available, and easily customize the frames and buttons offered for your DVD menu. You can also add background music and images for the menu. It is easy to install and performs smoothly. One con could be that it is not compatible with Windows 8, and another minor con is that after you create your own template, you are not allowed to save it among the given ones. However, these are minor shortcomings and most users are happy with the software. Basically, WonderShare provides a unique customized experience for burning DVDs and editing.